As a former bishop and current professor, Wright skillfully crafts exemplary scholarship into a readable treatise, while showing pastoral care for his readers. His ability to reach a varied audience is evident in his For Everyone New Testament Commentary series, and this ability shines in Wright’s latest work as well. 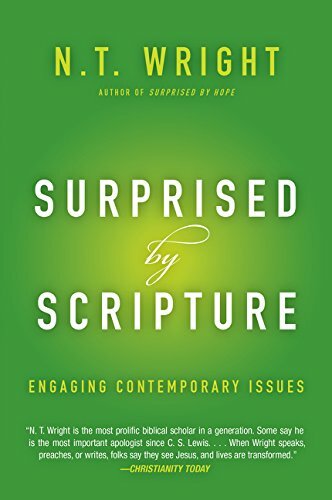 Using several case-studies, Wright illustrates how “people may not expect the Bible to have much to say on these topics . . . [and] when it does speak to them it may not say what people have imagined” (x). Wright found he was himself “surprised by scripture” and developed these essays in response to lecture requests on various topics. The first three essays interact with the scientific community. In “Healing the Divide Between Science and Religion,” Wright lays out his case for Epicurus and Lucretius as predecessors of Darwin, and suggests a deep-seated opposition between a “system in which God has been disinvolved” and one that “insists on God’s actions in creation and providence” (15). His second essay asks, “Do We Need a Historical Adam?” and suggests that even asking the question raises concerns about scriptural authority (27). In his third piece, Wright examines the difference between scientific inquiry and historical analysis, using the resurrection of Jesus as an important example. Subsequent essays include conversations on creation care (and how it relates to our views on the second coming) (95), the question of systemic evil in the world and our needed response to be “living embodiments of that new creation” (128), and three ways to “listen afresh to the message of the whole Bible” (140). In his chapter on idolatry, Wright also illuminates the importance of biblical wisdom as a remedy for widespread worship of “Mars, Mammon, and Aphrodite” (156). He engages in conversation with political systems and, in particular, notes the importance of the church playing its part “in holding the powers to account and thus advance[ing] God’s restorative justice” (179). Nestled among the wide ranging topics above is Wright’s essay, “The Biblical Case for Ordaining Women” (64-82). Of interest to me at the outset was the titular shift from “women’s service” (2006) to “ordaining women” (2014). After comparing the two essays closely, however, I do not see much expansion of thought—the beliefs described in his 2006 Priscilla Papers article remain essentially unchanged in his 2014 book. (In fact, much of the book’s essay is word-for-word from the article.) Perhaps adding the phrase “women’s ordination” increases the book’s list of topical subjects (for library searches) or search-engine optimization (e.g., for Google and Amazon). For long-time members of CBE who may be discouraged by this similarity, I will highlight a few developments that were added in the book. When calling attention to women leaders in the early church, Wright suggests incredulity over translators fighting about Junia being a woman since no historical or exegetical proof exists that she was a man. He mentions the woman who anointed Jesus, pointing out, “this was a priestly action that Jesus accepted as such” (69). There is an expanded introduction about cultural issues and head coverings (73) and a brief comparison of the use of kephalē in Ephesians to that in 1 Corinthians (75). Wright does not doubt authorship of the Pastorals. He offers an updated translation of “the hardest passage of all” (1 Tim 2) which he hopes will show how “the words can actually mean something significantly different than what has usually been assumed” (78). He recognizes that some might charge his translation serves only to “tailor this bit of Paul to fit our culture” but asserts that there is “good, solid scholarship” behind it (79). Wright does take the time to explain the word authentein as having overtones of “being bossy or seizing control,” without getting into the nuances of the Greek (the book, after all, is not an academic one) (80). Because CBE's website provides easy access to the 2006 article (www.cbeinternational.org/resources/article/editors- reflections-autumn-2006-204), 2 there is no need to buy this book for the chapter on women’s ordination. Having said that, there are certainly other positive reasons to read it, and its topical variety provides helpful discussion points on “contemporary issues.” One encouraging point about the broad appeal of this book (both in its writing style and array of content) is that many who have not yet been exposed to the teachings of CBE will perhaps pick it up and read it. On the topic of women’s ordination, the well-respected N. T. Wright would be a positive first read. Anyone with particular interest in one or more chapters will be happy to note that many of them have been expanded into their own books, and Wright alludes to these titles within each essay to recommend further study. Our own study of scripture often leads to more questions than answers, and Wright asserts, “some of the most important questions in life need to be approached from several angles at once” (xi). While the chapter on women may not be a “new angle” to some CBE supporters, it will certainly be new to many. Wright’s book serves as a vital conversation partner for dialogue and provides an original and biblical perspective for some current issues, including women’s ordination. 1. Priscilla Papers 20, no. 4 (Autumn 2006): 5-10. This 2006 article was adapted from Wright’s address at the 2004 “International Symposium on Men, Women, and the Church,” co-sponsored by CBE, Women and the Church (WATCH), and Men, Women and God (MWG) at St. John’s College in Durham, England. 2. All issues of CBE’s award-winning journals are available for free under the Publications Menu at www.cbeinternational.org.